My husband and I signed up for the Hypnobabies Home-Study Course. It required a lot of diligence and intentionality, especially with a two year old in tow, but I did it and it was so worth it! My husband didn’t go into work, our son was at his mother’s day out program and my mom had come into town to help, so I was able to focus on resting. When I was up and about, the waves were closer together and when I lay down, they slowed down quite a bit. I shared with my husband when I woke up from my second nap that things were about to get crazy, and I knew that Zion would be coming soon. My husband then began doing the dishes because I was so calm and relaxed, he didn’t think it was super urgent until I assured him it was time to go! 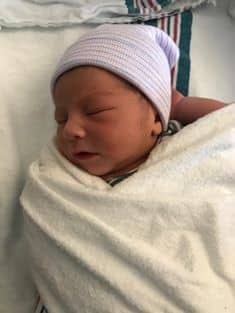 We packed up and dropped our son off at my SIL and then my husband, my mom and myself went to the hospital. We arrived at 6:30 pm. There were no rooms available in L&D or triage, so we had to wait in the waiting room. About 15 minutes (?) later we went into a triage room where I lay down on the stretcher so I could try and go into deeper hypnosis. By this time my midwife had arrived and things were moving quickly. I never made it out of triage and before I knew it my body instinctively went to all fours and I was pushing on the stretcher. Zion was born at 7:53pm, 6lbs, 5 oz and 20.5 in. Once we left for the hospital, there were so many distractions I wasn’t able to get into deep hypnosis. However, the hypnosis tracks, cues, positive mindset, mantras, etc. helped immensely and I was able to have a more calm and comfortable unmedicated birth than with my first. 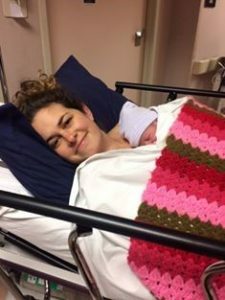 I am grateful that Hypnobabies allowed me to comfortably do most of my birthing at home and while transformation and pushing were not completely free of all discomfort, Hypnobabies helped me to remain relaxed and the process went very quickly. I used my tracks most of the time, but having my husband use the Relax Cue and put his hand or forehead on my forehead was very helpful and he was such a huge support for me during this entire process. I felt even more connected to him doing Hypnobabies than with our first birth. Without the monitors, no one knew how intense my birthing waves were because I was so calm and present. If and when we have another baby I will definitely be using Hypnobabies again. 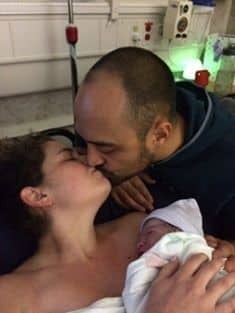 I absolutely loved going into this birth with so many useful tools in my toolbox and a confidence that put my fears aside. We also paid for a Home-Study Advantage class the day before I started birthing (once I was done with this class I felt ready!) which boosted my confidence and trust in the process. When going through the files on Hypnobabies Support Group FB page, I found a written visualization and did the same for my own birth. Let me say – it worked! So many similarities between my visualization and actual birthing day, it was awesome. The Facebook group has been so helpful and I’ve loved reading everyone’s stories. They encouraged me so much and I hope my story does the same.